Internally displaced person camps (file photo). One consequence of the prolonged conflict is that South Sudan - a nation of over 13 million people - is now one of the main sources of refugees in the world. The economy has almost collapsed with annual inflation fluctuating between 100% to 150%. Conflicts within and between communities have led to social fracturing and the erosion of social cohesion. The retreat into ethnic cocoons, which threatens national unity, is fuelled by conflict. But it's also reinforced by the ruling elites failure to embrace diversity and to disperse power and resources from the centre. In the middle of this is a man made famine caused by the conflict and the collapse of food and economic production. 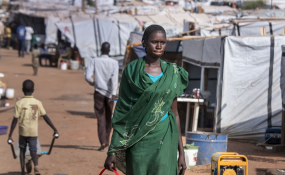 The result is mass displacement within and outside South Sudan's borders. Another consequence of conflict is human rights violations, including war crimes and crimes against humanity. The disintegration of security institutions has rendered the state unable to protect lives and property. What's worse is that it has itself become a key source of violence and instability. The erosion of the government's presence in rural areas and its retreat to Juba, the capital city, has prompted some to argue that South Sudan has been reduced to a city-state. Yet, this "national conflict" overlays a cornucopia of preexisting conflicts. These include conflicts over resources, including land, pasture, water, and cattle. Moreover, the culture of violent revenge has replaced the traditional compensation system and often results in children becoming legitimate targets of revenge. There's a real danger that South Sudan could revert to a stateless entity if the current peace agreement fails again. There would follow a period of massive death from famine and conflict. The vast ungoverned space would also pose a regional security vacuum.